An exciting new book launched last night — did you get your copy yet? If you got it last night, chances are you were lucky enough to get it signed by editor Laura Pope or a number of contributors in attendance. 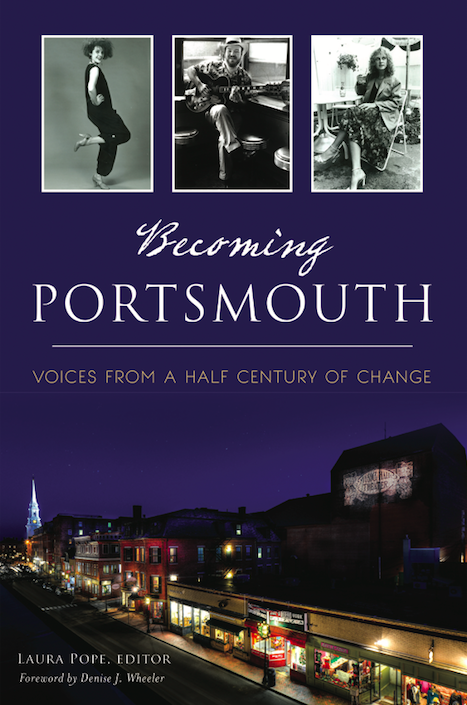 Becoming Portsmouth: Voices from a Half Century of Change (1950-2000) is a compendium of essays from 15 contributors writing about the city, from its days as a gritty, working class town, to its era as a beacon for the arts, culinary excellence and historic preservation and finally to a time when Portsmouth has become a bustling tourist destination. It has been called by Jane Murphy: A Blast from the Past. It really is a collective message in a bottle, remembering how the city has changed and transformed so strongly and so swiftly. The idea is to leave these essays as a chronicle of these years, in the not so distant past. You can pick the book up at RiverRun, Barnes & Noble, Amazon or direct from the publisher The History Press/Arcadia Publishing. It’s also available as an ebook.